With all the great citrus coming this winter many of my followers are desperate to do something with their oranges. Many people are up to their ears in marmalade and have tried many recipes to use up the oranges in as many ways as possible. Cynthia, a follower from Facebook, sent me a recipe that she wanted to do to make the sauce that she loves for an orange chicken. 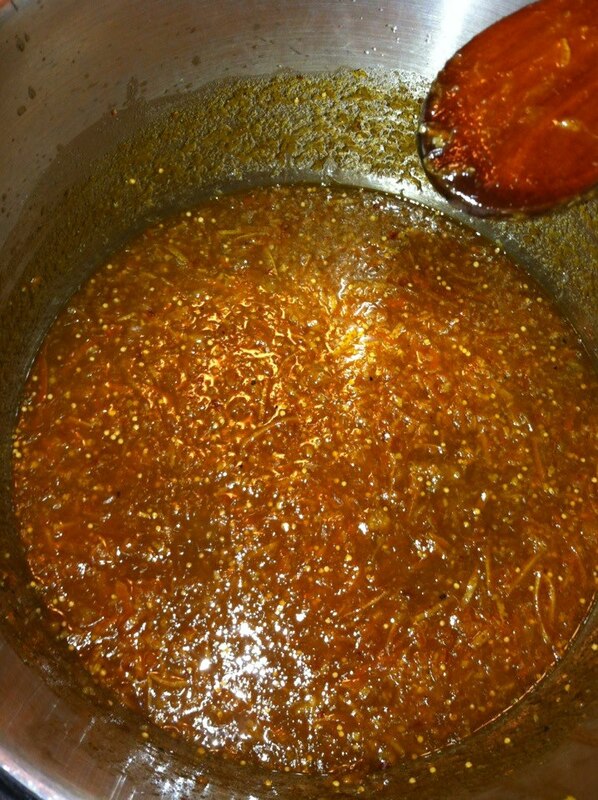 Not just a basic sauce but one that is kicked up and has some of the spices that you would find in Thai type foods. From Cynthia: "It thickened up as it cooled like a slightly runny marmalade but once it was hot and over chicken it thinned out, I guess you could add cornstarch when you add it to chicken but we liked it fine as is. There are No thickeners in the Thai Kitchen Green Curry paste. The ginger and garlic were smashed in a mortar/ pestle. Tamari soy is a darker soy sauce, in my case it's gluten free that's why I used that. It tastes great to me but we like strong flavors. I can't be the only one sick of marmalade lol!" Cynthia took this idea from the plum sauce from the Ball Book but checked with me for safety. 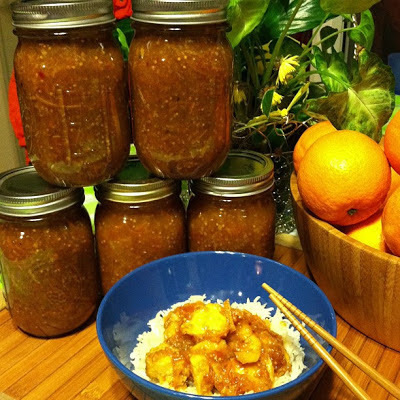 Cynthia dedicated this recipe to her friend Heidi and her very productive Navel Orange Tree. This recipe is set up for pint jars. If you want to make them in smaller sizes you can process them for the same time. Enjoy! Preparation: Prepare 4 pint jars, lids, and rings. Sterilize the jars and keep them in the hot water till its time for processing. Make sure to fill your water bath canner and get the water to a simmer. Prep by zesting the oranges with a vegetable peeler, avoiding any white pith and julienne. Set aside. 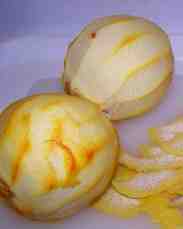 Remove all pith from fruit and chop, reserving the juice and combine with zest. Using a (1) potato peeler, peel the outside of each of the oranges and set the peels aside. 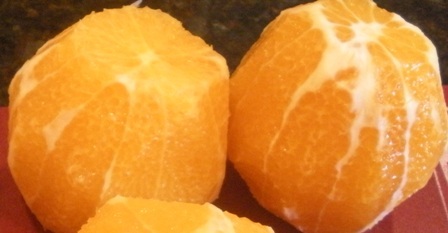 When you have completed the entire peeling, remove all the (2)white part of the orange, which is called the “pith”, so that you can see the (3)flesh to segment the oranges. You can cut the orange in half width wise and separate the segments in smaller sections being careful to get rid of seeds and any of the membrane or internal white parts as you can. 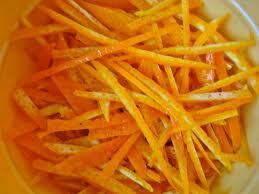 Once you have segmented the oranges into a bowl cut the peels into a (4) fine julienne or small strips. Cooking: In a large stainless steel or enameled dutch measure 3 cups of fruit/zest mixture and 3 cups of water. Simmer on low for an hour until fruit and zest is soft and volume has reduced to 5 cups. Add onions and simmer for 10 minutes or until onions are soft. Add the rest of the ingredients, simmer for 15 minutes. Using a regular or stick blender pulse the mixture till it’s mostly smooth with just a few zest strips remaining for texture. Remove from heat. Filling the jars: On a dishtowel place your hot jars and using your funnel in each jar fill leaving 1/4” headspace. Remove air bubbles and refill to the proper headspace with the liquid brine if necessary. Taking a clean papertowel wet it with warm water and wipe the rims of the jars removing any food particles that would interfere with a good seal. Using your magic wand extract the lids from the hot water and place them on the now cleaned rims. Add your rings to the tops of each of the jars and turn to seal just "finger tight".